I was admiring my heart punch the other day when I realized it would make great shamrocks! So, I took some paper, some scrapbooking brads and a little bit 'o twine (like that Irish accent?) and put together a little garland. I decided I preferred the way three leaf clovers looked over four leaf ones. Clovers still represent St. Patrick's Day, and I don't believe in luck anyway! So, I punched out three hearts for each clover, and then free handed a little stem pattern. Your stem will need to be longer than you think, since part of it will be covered by the leaves. Then I stacked three hearts together and pushed a thumbtack through them close to the bottom of the heart. The brads I bought weren't sharp enough to go through that much paper on their own, so this helped to get them started. Then, thread the brad through, and before separating the prongs on the back, arrange your hearts to form a clover. When you like the arrangement, add your stem, and open the prongs to stabilize the brad. And you have a clover! Repeat for as many clovers as you need. I bought 12 brads and only ended up using 10. Then punch holes with a standard notebook punch in the two horizontal hearts, and thread them on your twine. I tied knots in between the clovers to add some visual interest. And then hang your garland wherever you like! I thought this was a great way to re-purpose my heart hole punch. I was also happy that I could use more muted greens, rather than being stuck with the bright Kelly green that most store bought St. Patty's decorations use. 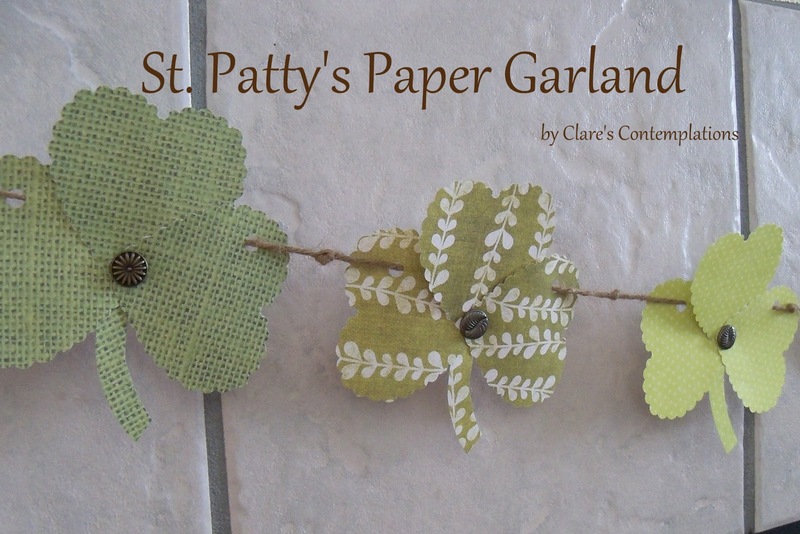 So, I debated about whether or not to publish this, because I have a St. Patty's Day craft that I really want to get posted *before* the 17th, but I decided that I better go ahead and put it all down, or next year I will surely forget what I did! I love doing a Valentine exchange with adult women. To me, Valentine's is a holiday about all love-not just the romantic kind. I actually went to more trouble for my Bible study group than for Joel, but I can promise you that they were much more grateful, too! I had pinned the link for this brown sugar hand scrub, and after I saw these adorable little jars at World Market, my Valentines were born. I had an amazing coupon to World Market so I got these cutie jars for $0.50. I got the perfect little files at Target-total bonus find in the party favor section! I tied it up with ribbon and used my new heart punch to tie on scrapbook paper labels. I think they turned out pretty cute. I also put together these fun "Love Potion No.9" bottles for the kids' groups (Josie and Carson each gave out signed Valentines but these were from me). I got the printables from here. I found the little heart shaped straws for $0.25 at Party City. In the tutorial that went along with the labels, the girl used 12oz. bottles of water, but the packets of Kool-Aid specifically say they are for a 16.9 oz bottle (a regular size one) and I figured that a bunch of 3-7 year olds were not going to understand that they needed to use 3/4 of a packet, and too strong Kool Aid is gross. Plus, full size bottles are cheaper! I thought they turned out pretty well. The kids loved them! All that of course, was prepped the night before. On the actual day, since we had Bible study, I did donuts and bacon for the kids for breakfast. They loved their little cups from Walmart. My sleepy Valentine. They loved their donuts! I love the way his eyes sparkle, even at 7:30 in the morning! They made out like bandits with their Valentine exchange. Every body gives such cool cards now. They got tattoos, magnets, bracelets, stickers, and of course, candy! My other sweet little Valentine. Boy Wonder doesn't do so hot in the posing arena, so you just get him, no stuff. We ended the day at Culver's, which was nice. I prefer to do Valentine's dinner as a family while the kids are still young. There really isn't anyone that I love to be with more than my family! We haven't had much snow here. After the majority of winter is over, that is when it snows the most, and as usual, we got about 5 inches on Wednesday. The kids were very excited to finally get some use out of their snow gear-as a matter of fact, we hadn't even taken the tags off Josie's snowpants until then! Playing in the snow demands hot cocoa. (I found out that it shouldn't actually be called "hot chocolate" unless there is liquid chocolate involved. I use the powdered kind, so it doesn't fit those parameters.) And not just any hot cocoa, but the best! -Nestle's Caramel Chocolate Cocoa. Do not substitute. It *must* be this kind. - Any kind of ridiculously sweet sugary creamer- in this case, I used International Delight's S'mores, which was perfect. You take your mug, use a tall one, it tastes better. Put your cocoa and two marshmallows in the bottom. I like to use my Kuerig for the hot water, it makes it a good temp (cocoa water should never be boiling) and the steady stream of water over the marshmallows makes them melt. I use the next to largest brew size (that is 10 oz. in case you were wondering, or doing it the old fashioned way with water on the stove). Then stir it all together and add a generous amount of creamer, probably three or more tablespoons. The great part about that, is that the cold creamer will make the cocoa the perfect drinking temperature. Then, if you are really feeling decadent, add some canned whipped cream. An extra marshmallow, merely for "photography purposes", and ta-da: practically perfect hot cocoa. It also spurred some creativity. I have had this "snowman kit" for a long time, but we kept forgetting to use it. (Dollar Spot at Target-sweet!) Well, I finally remembered, and the snow was not good for packing. So Josie came up with this-she said Mr. Snowman was "laying down". I was pretty impressed! Carson, typical boy, had more fun throwing lumps of snow. He went out to play again yesterday, too, and let me just say: snow is great for encouraging sleeping! Two hour nap, and then they both slept in until 9 am. If you like this post, I created a printable that you can use to top your Valentines with! Check it out here. I was inspired to make this trail mix-by a cereal! I had purchased some Quaker "Whole Hearts" cereal a few months ago, and ran across it right before Valentine's Day. 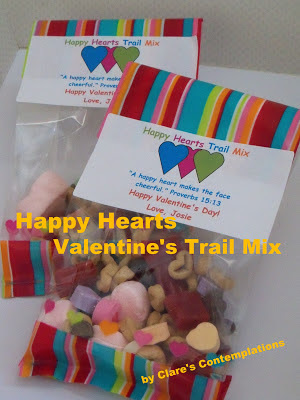 How could I *not* want to make a trail mix with cereal shaped like hearts?! It will make enough trail mix for about 40 half cup servings (including marshmallows). I love using shipping labels to close treat bags because it accomplishes two purposes: it gets the message across and it closes the bag more thoroughly than the little twist ties that usually are included. I made a super simple graphic with Word Art and made it cheerful by playing with the font colors. These are for her Awana Sparks group, so I thought the Scripture was really appropriate. Then my "happy helper" helped assemble the ingredients. A note: if I made this again, I would leave out the marshmallows. They got a teeny bit squished, and made measuring it difficult. In the end, we pulled the marshmallows out of the mix, added four or five to each bag and then added the rest of the mix. It was much easier that way! Josie loved stirring everything together. See how the marshmallows kind of "float" to the top? Easier to add them separately! After it was all mixed together, we added a generous 1/4 cup of just the mix to each bag of four or five marshmallows. It ended up being a scant 1/2 cup all together. Since it is full of sugar, I figured that would be plenty! We folded the tops of the bags over and sealed them with the stickers. Aren't they cheerful? I am obsessed with washi tape (paper tape). I love the concept, and the colors, it is just the easiest thing to work with! I have been dying to be crafty lately, but was feeling uninspired. I was trolling the interwebs when I came across this adorable washi art from "My Sister's Suitcase". It was for spring, but I knew it would be so easy to make it suit my needs. I purchased washi tape from Target back before Christmas. I had received some as a gift and I fell in love, but hadn't really had the chance to use it; and then I purchased three more rolls when it was on sale in December. It was calling my name and this was the perfect opportunity! -washi tape: just in case you are the only one who isn't familiar with this stuff, it comes in four packs (the four rolls I have above came together) for $4. This project only uses a tiny bit. -something to adhere your embellishments. 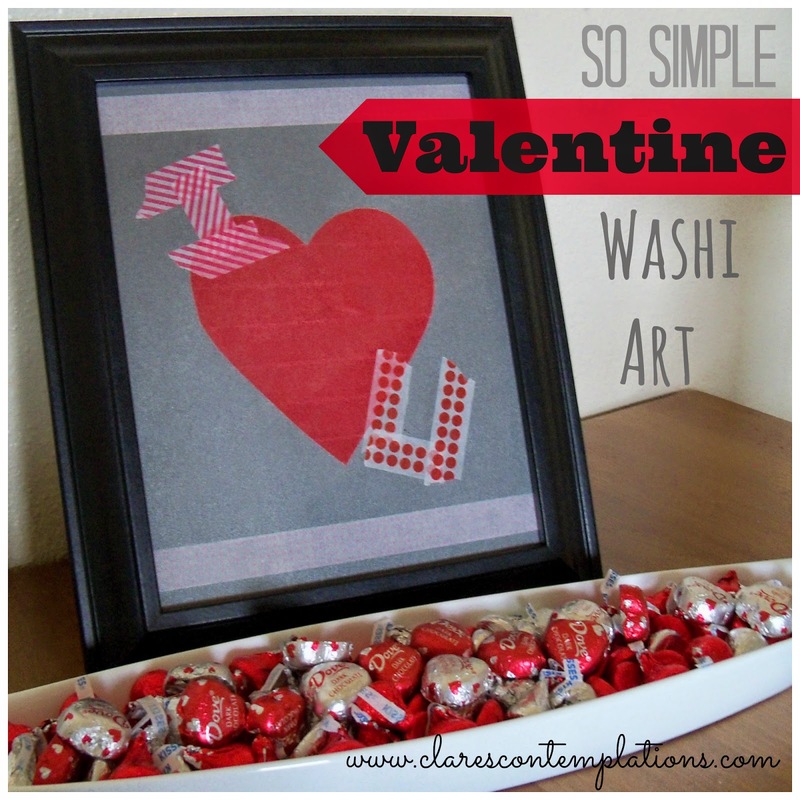 I "heart" glue dots! -frame, 8x10 is perfect if you are backing with letter size paper, you will only need to trim it a little to fit. I had all these supplies on hand, so this project was free to me. I reuse this poor frame all the time-this is the third thing it has had in it in the last three months. Yay for $3 Walmart frames! First, trace your shape onto the *back* of the contact paper. You are essentially making a "sticker" with your washi tape, so that will go on the front of the paper. Then when you remove the contact paper backing, you will have your washi tape on the front and the sticky part on the back! I went over my designs with a permanent marker to make them show through to the front. Remember that your image will be reversed when you flip the paper over, so if you were doing a letter or something you would want to trace it backwards. See how you can see the shapes through the paper?I used water bottles to hold down the edges of the paper, since it has a tendency to curl. 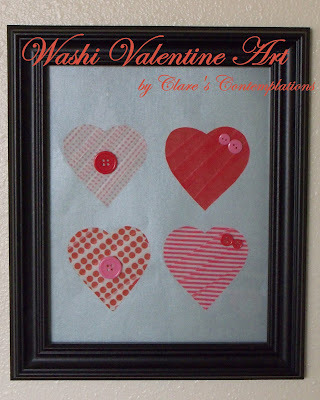 Cover your shapes with washi tape! It is so user friendly, I could pull it up and place it over and over. I overlapped mine, not placing it perfectly straight because I liked the handmade look it gave it. If you haven't noticed yet, yes, I changed my mind about the shapes and switched from one large and two smaller hearts to four smaller hearts. But this project was so quick it didn't even matter! I realized as I was typing this that I forgot to take photos of this part. I know it probably seems completely self-explanatory to most of you, but just in case, you have the washi tape front, and the backing from the contact paper. I decided to use my big heart from earlier to show you how it is done. Peel off the backing and you have a washi sticker! I found the scrapbook paper to be pretty forgiving, I could pull my stickers up and reposition them. I plopped this heart in the middle of the paper. And then used some more tape to give it a little flair! I didn't use anything but tape on this one. I used glue dots to place the buttons on this one. They hold securely but they don't add bulk like hot glue does, and they are much faster! Since I was planning on putting the glass back in the frame, I also knew it wouldn't need to be super permanent, as the glass would help keep it protected. And this is the second one. This whole project takes about 15 minutes, if that. It probably would have only taken me about 5 minutes to put the second one together. It was a perfect last minute craft! Have a happy heart (art) day!